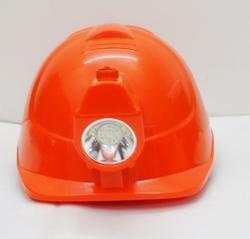 Safety Helmate:In many industrial working environments, for example, mining, power, construction, and forestry, the risk of head injury to workers is constantly present. The most serious risks are physical injuries, which can be as a result of the impact of a falling object or collision with fixed objects at the workplace. Due to the nature of these work activities, it is not always possible to eliminate such risks with just appropriate organisational solutions or collective protective equipment. 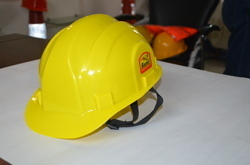 Therefore, the only way to ensure the safety of workers is by using safety helmets. 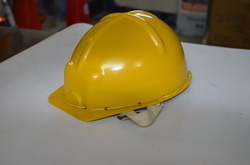 The type of helmet will depend on the specific nature of the physical risks that have been identified in the risk assessment undertaken for the activity. 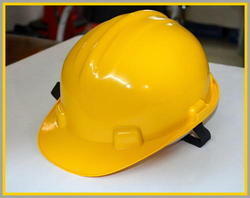 This article provides information for users of protective helmets as well as employers and OSH engineers. It includes information on definitions and gives the requirements for different kind of protective helmets that offer protection against physical risks. 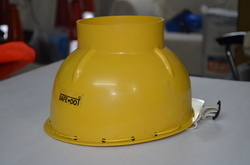 These helmets are made of the light Polyethylene therm-plastic for removing the chemical resistant of the dust particle.Safety Helmet is Available in red, blue and yellow color in the market. It is developed with the different numeric parameter by the engineers to provide them an optimal strength. They are easily washed by the soaps. 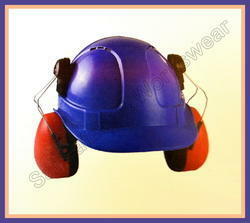 Safety Helmet with Ear Muff that we manufacture and trade is widely demanded in several construction industries. The offered scope of ear muffs is made by bona fide sellers, who guarantee to get it strict adaptation with the global quality standards and guidelines. Designed specially to use with Helmets. Spring loaded Stand off function to press firmly to the ear for better seal against noise. Easy Snap-on/off Mechanism for Helmet Mounting. With a fresh, sleek shell design, the popular helmet line now includes an unvented Class E model, and Serpent is now available in several new colors. Many of the original features that have helped make compliance less of a battle for employers have been maintained: a rotating ratchet adjustment system (pin-lock also available); an eight-point, six-strap suspension for extreme comfort and impact resistance; and a soft, cloth brow pad. And it’s still lightweight—just 13 ounces—to ensure day-long wearability. Plus, the suspension system comes partially pre-installed, lowering the risk of ill-fitting helmets and potential injuries on the job. High-quality Welding Screen With Helmet can also be availed from us. These helmets are highly demanded in cutting and welding purposes to protect eyes from welding sparks and harmful UV lights. We ensure that each product offered by us is free from any fault and is reliable, therefore our quality controllers sternly check them on certain quality parameters. 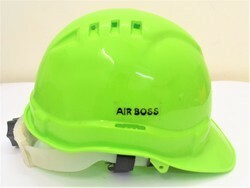 We offer these helmets at most economical rates. In many industrial working environments, for example, mining, power, construction, and forestry, the risk of head injury to workers is constantly present. The most serious risks are physical injuries, which can be as a result of the impact of a falling object or collision with fixed objects at the workplace. Due to the nature of these work activities, it is not always possible to eliminate such risks with just appropriate organisational solutions or collective protective equipment. 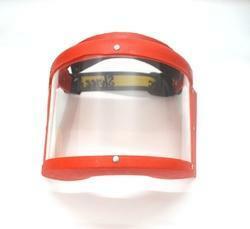 Durable, molded general purpose polycarbonate faceshield offers high impact face protection. Developed for use in metalworking, utilities and many other industries. Size: 9" tall x 14.5" wide x 0.08" thick. 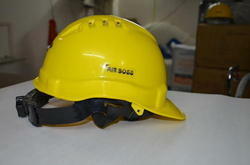 we are engaged in providing an exclusive range of Loader Safety Helmet. 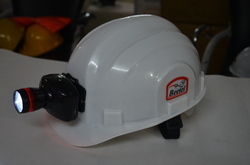 Widely used in construction industry and coal mines, the given helmets are provided with space to ensure easy carrying of material. These are designed using premium grade material and offers excellent protection due to their robust design. 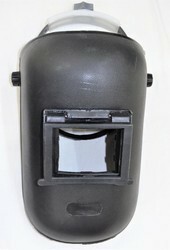 Being a well-reputed company in the industry, we are presenting a superior quality range of Face Shield. These shields are developed by making use of utmost grade basic material beneath the direction and supervision of highly skilled engineers. Our offered products are available at most inexpensive prices to satisfy the need of our respected clients. 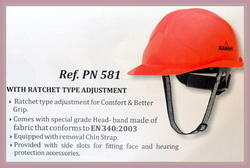 Safety Helmets with slide-lock head size adjustment features a four-point, adjustable nylon suspension. 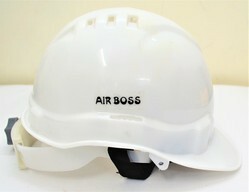 The vents on top of the hard hat increase air circulation to keep the wearer cool. 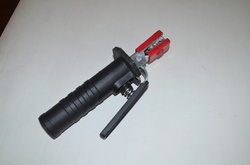 the market trends, and a strong commitment to customer satisfaction, we are engaged in offering Executive Ratchet Type. Our offered product is designed using world class material & modern techniques with the help of competent workforce in accordance with the quality standards. In addition, our product is appreciated among customers owing to its high quality & fine finish. Customers can avail this product after checking completely from vendor’s end. So as to fulfill the ever-rising and changed desires of our honored patrons, we are readily engrossed in presenting a comprehensive variety of Windsor Face Shield. Making use of optimum class basic material altogether with modernized and highly advanced amenities; these presented products are made with excellence under personnel command. Also, our patrons can get these from us at rock bottom costs. Durable in nature, offered KD 1000 Welding Holder is superior in quality and made under guidance of professionals. Light in weight, offered products are prepared of best input. 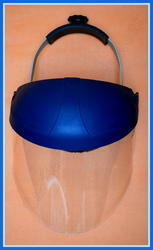 Heat resistant in nature, offered welding holders are reliable and meet under guidance of experts. We charge acceptable cost for this welding holder. Supported by a team of expert professionals, we have been able to offer finest quality Welding Head Screens. These are known for their quality and durability. Window Size: 2 x 4 ¼ in. & 3 ¼ x 4 ¼ in. With sincere intentions to preserve and uplift our reputation in the market, we are offering a comprehensive assortment of Chargeable Helmet with Head Lamp. Our offered range is manufactured in such a way that we are able to maintain globally accepted standards. Owing to their remarkable features, these products are largely demanded in the market. In addition, clients' can avail the offered range from us in a wide range of specifications. Quality 5W bright dual mode full featured head lamp torch for multipurpose use like outdoor, home, hiking, trekking, travel, bicycle night riding, camping etc. -To turn “ON” the Head Torch press the “ON/OFF” button at top once, to increase the power of the LED which in turn will increase the brightness of the Head Torch press the “ON/OFF” button again i.e. two times. 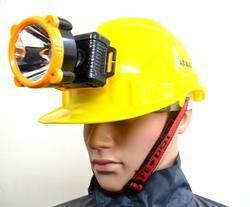 -To turn “OFF” the Head Torch press the “ON/OFF” button three times. -To charge the Head Torch unwind the 220V round pin wire given along, plug one end of the wire in the battery charging jack on the unit and then plug the other end of the wire in any standard 220V AC power socket. -There is a small LED indicator given near the “ON/OFF” button, indicates charging. Once fully charged unplug the wire from the AC power socket, wind it and keep it at safe place. -Avoid looking directly into the LED as it has a strong beam. -It takes about 2-3 hours to charge the in-built rechargeable battery inside the unit completely. 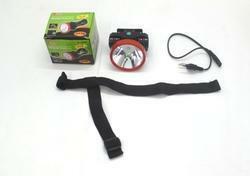 -Continuous light for 4 hours once fully charged. 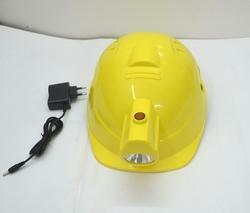 We are a prominent manufacturer and exporter of superior quality Helmet With Head Lamp. These helmets made available by us comprises of best quality in international standard with perfect design and high durability that are sourced from the most authorized vendors of the market. Offered at affordable prices, our product-line is applauded for its perfect finishing and eminent durability. Product DescriptionA basic necessity for the work men at mines, railways, workshops, tunnels, inspection crew, etc. LED consumes less power hence long backup with lot of energy saving. Heavy duty battery gives extra long backup. Powerful Beam. No Filament in LED lamp hence Vibration resistant and shock tolerant. No replacement headache, as LED has life of more than 35,000 hours. Available in 2 models Regular and Extra Long backup. Backup Time 1W: 08 hrs., 3W: 4 hrs. 1W: 14 hrs., 3W: 10 hrs. Charge Time 5 – 6 Hrs. 4 – 5 Hrs.